New Canvas users should create their Canvas password prior to the first day of class. However, you will not be able to access your distance Education courses until the first day of the class. If you already have a Canvas account from a prior semester, you may continue to use your Canvas username and password. Navigate to the Canvas login page. If you are a new Canvas user, do not enter any information in the boxes labeled MyCCP Username and Password. Click on the New User/Don’t know your password? link. Enter your College email address and click Request Password. In a few minutes, you’ll get an email from Canvas in your College email account with a link to set your password. Click on that link, then type your new password in both boxes. Go back to the Canvas login page (please bookmark this link). Enter your MyCCP Username (for example, jsmith) and the password you just set. Click Log in. Note: Your username is not your full email address. 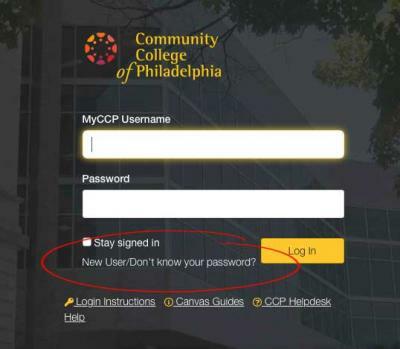 Do not use @ccp.edu in the username box. If you have problems setting up your Canvas account, contact the Office of Distance Education via email at distance_ed@ccp.edu, or call the Help desk at 215-496-6000.